The Board of Cricket Control in India (BCCI) announced on Monday the 15-man India World Cup squad that will play the ICC tournament starting on May 30 in England. With veteran Dinesh Karthik included in the team, young turk Rishabh Pant has lost the fight for the second wicketkeeper slot. There were otherwise no surprises as the selection committee headed by MSK Prasad maintained continuity. The only topic of discussion was the choice for second wicketkeeper. And 33-year-old Karthik was preferred over 21-year-old Pant. “The second wicketkeeper comes into play only if Mahi (Mahendra Singh Dhoni) is injured. We went ahead with Karthik because of his experience in big matches,” Prasad said as he announced the squad. Virat Kohli will be leading the team that comprises five specialist batsmen, two wicketkeepers, three fast bowlers, three all-rounders and two specialist spinners. Tamil Nadu all-rounder Vijay Shankar has been picked instead of Ambati Rayadu, as Prasad said the 26-year-old all-rounder from Tamil Nadu “gives three dimensions” to the team. “After the Champions Trophy, we have tried quite a few middle-order batsmen, which also included Karthik, Shreyas Iyer, Manish Pandey. We did give a few more chances to Rayudu but Vijay Shankar gives three dimensions. He can bat, if the conditions are overcast he can bowl, plus he is a fielder. We are looking at Vijay Shankar as a number four batsman. Now we have plenty of options for that slot,” said Prasad. Ravindra Jadeja has made it to the squad as the third spinner instead of a fourth pacer. KL Rahul has been included as the reserve opener. “He can bat in the middle order too, if the team management needs,” said the BCCI chief selector. He also said four additional medium pacers would travel to England with the team as practice net bowlers. India will play their first World Cup match on June 5, against South Africa. 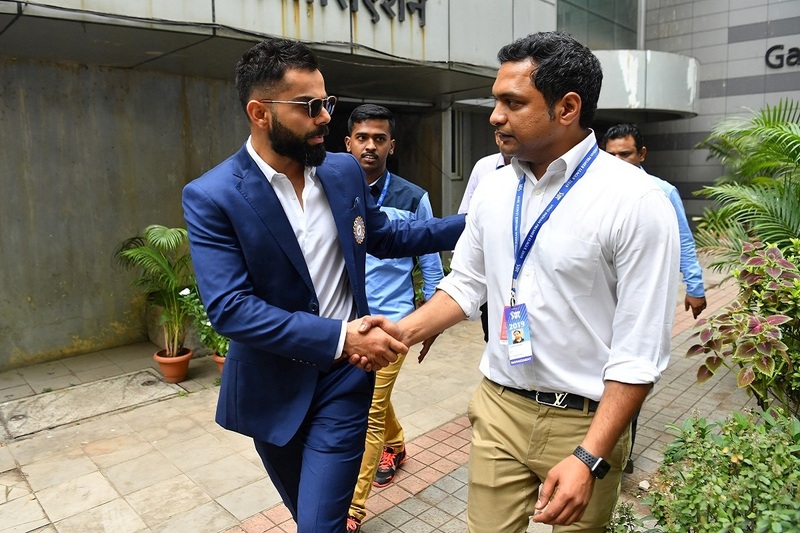 India World Cup squad: Virat Kohli (captain), Shikhar Dhawan, Rohit Sharma (vice-captain), KL Rahul, Mahendra Singh Dhoni (wk), Kedar Jadhav, Hardik Pandya, Vijay Shankar, Kuldeep Yadav, Yuzvendra Chahal, Mohammed Shami, Jasprit Bumrah, Bhuvneshwar Kumar, Dinesh karthik, Ravindra Jadeja.